As far as chocolate chip cookies go, there aren’t too many ingredients. They mix up quickly and make a somewhat small batch. I used a regular sized ice cream scoop to portion the cookies and got 11 big, soft cookies. You’ll get about that many — more or less — depending on how much fun stuff you add to the batter, such as chocolate chips, nuts, craisins, etc. 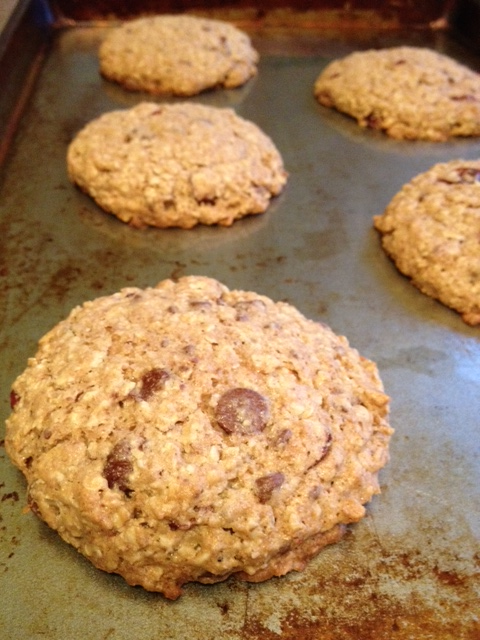 Like most oatmeal cookies, you can choose whichever add-ins and spices you enjoy to customize the flavor of the cookie. Oatmeal, raisins and cinnamon are a natural combination. Craisins, orange zest and extract plus dark or white chocolate chips is another good combination. Use what you like and try different combinations for variety. Click for recipe. For this batch, I used craisins, orange zest, a splash of orange extract and another of vanilla extract, and semi-sweet chocolate chips. Orange and cranberry are a great combo, and the chips add an extra flavor layer. I think dark chocolate chunks would be great in these. White chocolate would be tasty too, if you like white chocolate (it’s not my favorite, but I’d eat it in this combo). And if you’re reading all the whole wheat recipes on my blog and worrying that my sugar addiction is waning and I’m eating too many healthy things, don’t worry. I’m still here and planning more indulgent desserts. I have to admit, though, that I’m enjoying finding recipes that are a bit healthier but in a stealthy way. I feel just a pinch less guilty eating them. And if you don’t tell there is whole wheat flour in these, nobody will ever guess! These look yummy! And you can still make delicious sweet recipes without feeding an unhealthy lifestyle, there is every recipe in the wolrd you can make healthier and better! That’s all I do and people always think I eat so indulgently but really, it’s all clean delicious healthy food!